Delicious little collector cactus from Mexico. 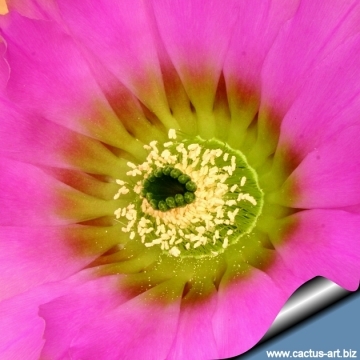 This cactus has large, pretty pink flowers with a clearer often greenish center. It's beauty makes it particularly desirable to collectors. Habitat: Grows on limestone terraces, altitude 550-700 (1500) m.
Description: Single or branching at the base when old. Ribs: approx.15- 20, width 5-10 mm. Central spines: 1 or 2 sharpen, light brown, darkly tipped. Radial spines: Up to 23, clearer white-brownish to white-greyish straight, closely pectinate. Blooming Habits: Appearing next to the stem tip, scented magenta-pink, with somehow darker midstrips, more brightly to green in the throat, 7-12 cm long and in diameter. Filaments light green, stylus and anther dark green. Fruits: Oval green-brownish. Ripe two month after blooming. Echinocereus baileyi var. brunispinus Backeb. : No central spine with brown, intelacing, bristly, radials spines. Distribution: Oklahoma. Echinocereus oklahomensis Lahman: It is one of the local forms of Echinocereus reichenbachii subs. baileyi distinguished by having 20-24 radial spines only 2 cm long and 0-2 centrals. Distribution: south-west Oklahoma. 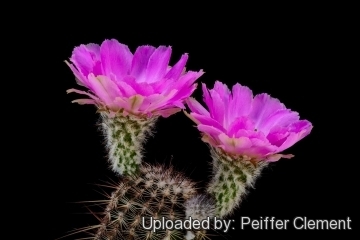 Echinocereus pailanus Fritz Schwarz ex Backeb. : has fine-textured pinkish-red or pink-brown pectinated spines. distribution Coahuila, (Sierra Paila)? 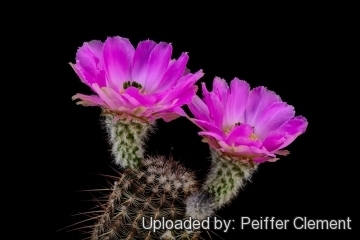 Echinocereus reichenbachii (Terscheck ex Walp.) Haage jr. ex Britton & Rose: Small solitary or slowly branching cylindrical shaped cactus.It has 20 to 36, white to tan pectinatd radial spines held closely against the the ribs of the stems, organized in 2 series. Central spines usually absent. Echinocereus reichenbachii var. 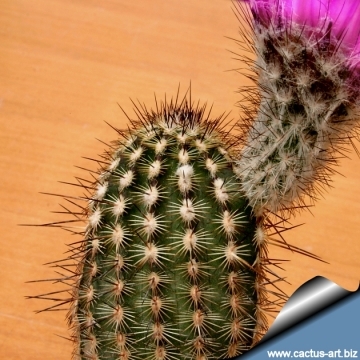 albertii L.D.Benson: This cactus has large, pretty pink flowers with a very dark center. It has dark cental spines 0, or 1, 2 to 3 mm long, purple-black in colour. The 14 to 20 radial spines are white with dark purple tips number, straight, closely pectinate, 3 to 6 mm long. Echinocereus reichenbachii var. albispinus (Lahman) L.D.Benson: This is a form of Echinocereus baileyi with white to delicately pinkish spines, up to 1-2 cm long. Echinocereus reichenbachii f. albispinus hort. non Lahman: It is intermediates between Echinocereus baileyi and Echinocereus reichenbachii subsp. caespitosus. It has white neat comb-like short spination. 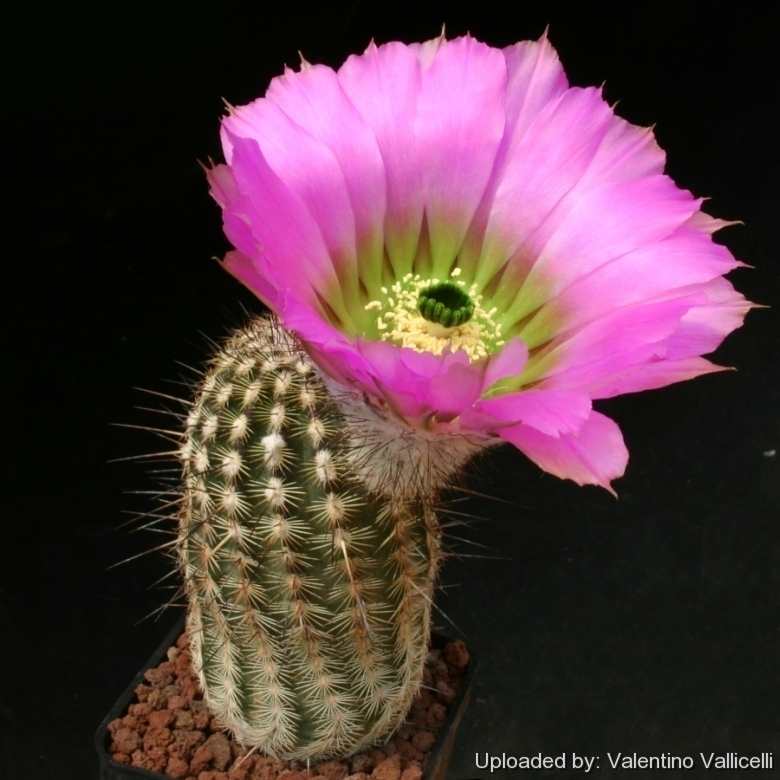 It is one of the smaller Echinocereus species. Echinocereus reichenbachii subs. armatus (Poselg. ex Engelm.) 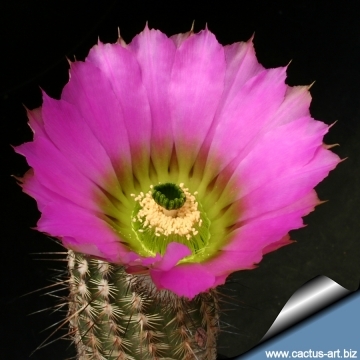 N.P.Taylor: This cactus has large, pretty pink flowers with a clearer often greenish center. It has 1 or 2 sharpen, light brown, darkly tipped spines. Echinocereus reichenbachii subs. baileyi (Rose) N.P.Taylor: No central spine with about 16 intelacing radials spines, that are bristly spreading and variously coloured, white, yellowish, fox red, brown or pink. Distribution: Oklahoma, Texas. Echinocereus reichenbachii f. brevispinum hort. : short spined form. Echinocereus reichenbachii subs. caespitosus (Engelm.) W.Blum & Mich.Lange in W.Blum et al. : The so called "caespitosus" is the form found in central Texas. Usually this plants lack central spines and are weakly distinguished from typical "reichenbachii". Echinocereus reichenbachii f. cristatus hort. : Crested form. Echinocereus reichenbachii subs. perbellus (Britton & Rose) N.P.Taylor: It has 0-1 central spine, fewer than 20 radials, and elliptic areoles; Range: Colorado, New Mexico, and central Texas. 1) Edward F. Anderson (2001) “ The Cactus Family”. Cultivation and Propagation: Cultivation: In culture E. pectinatus is without problems and regularly shows its beautiful flowers if we provide an adequate winter rest period. It is sensitive to overwatering (rot prone) needs good drainage, Keep drier and cool in winter. Need full sun; Cold resistant hardy to -5° (-10°) C or less for short periods of time.